Cheers to the last Full Moon of 2018. 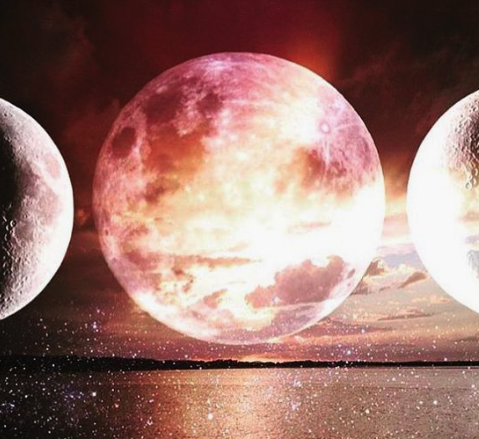 We Welcome our Full Moon in Cancer at 9:48am PST. (Exact). She will be our last full moon of this twenty-eighteen year. Can you believe it? She is also joined by (yesterdays) winter solstice and her polarity, Capricorn (sun). The Full Moon is a time where our emotions filter out and release themselves from our physical and emotional body. The moon rules our emotions, thus, why people believe that "the crazies are out" when a Full Moon is in the sky. A Full Moon occurs when the sun and moon sit in opposition, causing their energies to come head to head; much like a yin and yang. With these two energies, we find balance and clarity. When our Full Moon meets the zodiac of Cancer, our energy and emotions are heightened. The Moon is the ruler of Cancer and Cancer rules our 4th house, the House of Home and the early and latter parts of life. Cancer is in tune with her space, emotionally and physically. She reminds us that everything we are searching for is within us. Like the crab, her symbol, she is very at home with herself - without her shell, she is more vulnerable. Cancer teaches us to explore what makes us feel at home. She encourages us to look deep to what makes us feel secure and safe, in terms of home and family. Does your home make you feel warm? Safe? Loved? Cancer wants you to look at your physical atmosphere, is it decorated with colors and objects that are aesthetically pleasing or comforting? The Crab teaches us that we are in control of our environment, if we feel uncomfortable, we are allowed to redecorate, or find a new "shell." Take time to explore your area. Cancer is intuitive and follows her inner compass to align herself with where she belongs. This takes strength and vulnerability. Don't be afraid to strip yourself of your comfort zone and explore the bigger picture. With the Moon in the 4th House on this Full Moon, we are pushed towards being proactive toward our families and home. Cancer wants us to look at our home life in the past, present, and even towards the future. Do we need to detach ourselves from a painful living situation from the past? Does our home, now, look a lot like our childhood and upbringing? Explore the home you want to make for yourself and your family. This is a good moon to manifest your dream home and living situation. This is also a great moon for releasing any pain or tension you've carried from your childhood into your current life. However, her low side can be her vulnerability. When she feels too vulnerable, she can detach. Cancer has no problem "checking out," and distancing herself from the outside world. She can be too much of an introvert, is prone to anxiety because she distances herself, and she gets stuck in her emotional body. So be cautious. Just know, it's okay to feel. Take these emotions as the lessons that they are; something is causing you to feel the way you feel - it's your job to use your intuition and pinpoint the problem. Sit with them and then find the strength to move past it. Cancer Moon x Capricorn Sun - The Opposing Energies. As our Cancer Moon is in the sky, her opposer is also with her. The Capricorn Sun. Just as our Cancer rules a house, so does Capricorn. Capricorn is the ruler of our 10th house, the house of career and public recognition. Capricorn's energy wants us to focus on who we are in the public world. Capricorn wants us to focus on what makes us secure in public and career - all outside matters of the home. This is known as the house of ambition and material success. But with the low side, Capricorn can be egotistical with high community status or wealth. The task is to find a balance between the low side and high side of not only each sign alone but the balance between the two signs together. This Moon wants us to find where we can balance ourselves more between interior (home) and exterior (society). Do you need to work less and be with family more? In what areas of your life do you need to take away and give to? Is your public reputation more important that your career/family? Find the Balance. We are also challenged to look in the mirror and determine if we are the same at home and with our family that we are in public and with friends. Most of us aren't. We just need to find out why and in what ways we need to change. Full Moon is a great time for release - to rid ourselves of pain, anger, negativity, low energy, bad habits, etc. However, with letting go, we are able to call in what we wish. With being the last Full Moon of the year, this is a perfect moon to call in matters of home, family, and security. 2018 has been a year of intense retrogrades, natural disasters, and personal changes. But just as a Mother would encourage her children, Cancer encourages us to try just one more time. One more time this year. Ask the universe just one more time in 2018 for all the things your heart desires. Your complete deepest desires. Capricorn is the sign of longevity, use her energy to set long-term goals - both personal/home (cancer) and career/ambitions (Capricorn). Lay all your cards out on the table - Financially, Family, Career, Home, Education. Etc! Good Luck! Hello, Full Moon in Cancer!